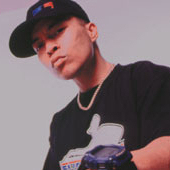 DJ Qbert is one of the most highly regarded names in hip-hop, both in and outside of the world of turntabalism. With a huge discography jammed with several classics, and tons of videos and DVDs, he is quite simply a legend. 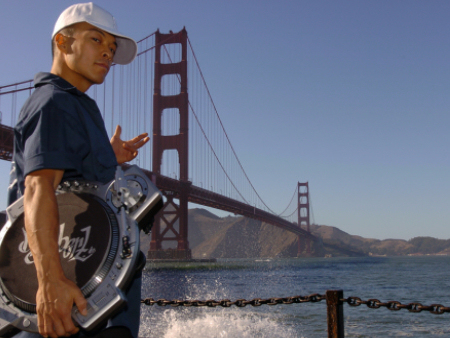 Inducted into the DMC Hall of Fame in 1998, he keeps himself busy teaching classes on the art of DJing to children, designing his incredible QFO turntable and clocking in for many shows each year. Ahead of his UK tour in April, I threw some questions the mans way..
Great! Everyone has good and bad days…. but everyday no matter what, is a great experience bad or good! We all know who you are, but what’d you tell an outer space alien who asked? I’m just a spiritual being having a human experience. Could you be kind enough to show me their ways of life of other worlds and other secrets of the universe (considering these are hopefully some kool aliens, ha!)? What’s the one definitive part of your career that you’d like the history books to remember you for? That I’ve found out that making others happy is the most true success and I’ve gotten to do that with what I know on the turntables, and I will continue to do it because there is no just one accomplishment… Life is one big ongoing project for me. Having accomplished so much, what keeps you doing what you do, or do you think there’s more innovation to come? “It’s not how good you are, it’s how good you wanna be” ... I continually have visions in my head of what I want to sound like, so I keep pushing to get there… and then it always changes and becomes better so actually there is no stopping. The DVD of my tour in Asia is almost done, so I’m just working to put the final touches to it. Then there’s another instructional batch of videos “Do it yourself skratching”. Also, another design update for the QFO. Look at www.turntabletv.com and a new website, www.thudrumble.com that will show all the new projects being built, a European tour all throughout April and making music as always, plus another video in the works. Who in hip-hop is giving you the most excitement right now, be it a DJ, MC, Producer or anyone else? I’m really into b-boy breaks right now, you know early 70’s funk, soul and jazz… I’m loving the drums and breaks because it makes me create music with all them funky sounds! But as for mcs in hip hop, I like the way Ludacris raps… He has skills behind that radio music. What do you find to be peoples biggest misconception about DJing? That it’s not a musical instrument. What’s the most substantial change in DJing you’ve seen from when you first started out to now? That it is a ridiculously crazier instrument than it was back in the days, with even the technology making it even more progressive. Do you think groups such as Dilated Peoples, Ugly Duckling and Jurassic 5, who hold their DJ as sacred are doing good things for the art form? on TV with Herbie Hancock back in 84’! Should more hip-hop artists and acts be placing a greater purpose on the man behind the decks on stage with them? Well if they want to… to each his own… It may not be their flavour to choose that path, but if they do use one, I always wish to hear them do something instead of being a sound effect guy or just a poser, or a wack DJ that they just picked at random, when I know very well that every city has some great skratchers or at least one from my experiences travelling all around and meeting tons of them in the darkest places, ha!... but whatever, some bands want a poser, and if that’s what they want, then to each his own. You must have travelled all over the globe and witnessed local scenes and loves for hip-hop along the way. What location has stood out the most? Usually the higher concentration of population brings out more crazy talent, you know like New York, Tokyo, Los Angeles, San Francisco, Chicago, Paris, London, etc. How far into planning is your European tour dates and what can audience members anticipate from your show? Always working on the kuts. After this interview I’m gonna get to work. Is there one show you’ve attended which you look back on as having been your greatest experience as a hip-hop fan? I guess the last shows I did. “The 4 Masters Tour” with Grand Wizzard Theodore, Jazzy Jeff, DJ Flare and myself! It was so fun and I really think I did a few of my best performances on some of those cities…It’s rare for me to believe I did my best, but I think I came off very well on some of those… There’s gonna be a DVD for the tour soon as well! I’m sure one of those cities would be my greatest hip hop experience in a tie with seeing rock steady crew break when I was in the front row in New York city in 1991 at the new music seminar! That was ill cuz ken swift threw some dice on the stage and I grabbed them! Not to mention DJ Cash Money performed a super clean set and Roc Raider won the DJ battle, and even Ultramagnetic MCs performed as well… Oh and KRS One did to! Ha Ha! Ya, ok.. that one show! What’s the most embarrassing thing that has happened to you on stage during a set? For those that aren’t very familiar with the DJ aspect of hip-hop music and culture, how’d you give a one sentence summary of it? Could you recommend one film, one record and one person which you consider to be the most vitals for a student of DJing? Is there any releases on the horizon which you’re looking forward to? Anticipating the Cut Chemist LP? Where about are you living and what’s the local hiphop vibes like? Do you get recognised in the street much? I live in Hawaii and in San Francisco… SF is full of art and hip hop culture as always being a big city and all, and Hawaii surprisingly has a bit of a huge hip hop scene as well. It’s not all paradise and hula skirts and palm trees. There’s a city there with a big population and urban lifestyle too… but once again I’m in my own world most of the time so I don’t see anything as much as I do on videos and on the net through friends who keep me updated with the latest crazy kool stuff. Besides from the obvious guys who you’ve worked with before, are you good homies with any well known hiphop heads? Na, my homies are my homies I’ve grown up with throughout the years…but well I guess all the hip hop stars I meet like the X-Ecutioners, Jazzy Jeff, GW Theodore, Biz Markie, Dilated Peoples, Shadow, Cut Chemist, Numark, Chad Hugo from the Neptunes, T La Rock, Dan the Automator, Prince Paul, Kool Keith, Mr. Hahn from Linkin Park, etc. are all guys that I’m friends with. Does a hot and important DJ in 2005 need to have access to the crazy new technology that keeps coming out? It’s not what you have, but what you can do with what you got. What were the first decks and mixer which you got and how long did it take you to build up your equipment? Just some home component stereo system with like the radio and the tape deck on the front… then I guess I got a Technics 1200 in a few months after, but just one for a long time, then another a few months later. There was an animated movie based on your Wave Twisters album. What’s the best show, The Simpsons, Futurama or something else entirely? I love Futurama! I got all the DVDs. But besides that… I love Ali G and also Mr Snow! Have you got any shout outs to add? I am a real big fan of Q Bert. I have shook his hand and I have his autograph. He is the sickest DJ in the world! Love you Q Bert. If only there were more people in the world with Q Berts attitude – the man is a legend, not just because of his skills of the 1s & 2s but because of open mind, great attitude and not just a willingness to share but a drive to inspire. He’s the one and only!